The sale season is an awesome time to pick up some of the wonderful products from The Body Shop at unbelievable prices. I bought The Body Shop Pomegranate Hydrating Body Spray during the sale and got a fabulous discount on it. 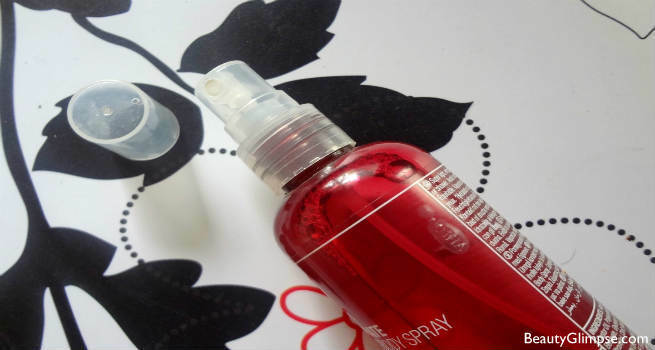 It comes in a nice red-tinted transparent 100 ml plastic bottle with a transparent lid from which you can see the body mist. The non-discounted new arrivals in the store have a different packaging with a silver coloured lid. Originally priced at Rs.795, I got it for Rs. 556 after a good 30% discount. It just reinforced my belief that a sale is the only time when I should be hauling up products from The Body Shop. The pack says that it is super light and provides refreshing hydration. That the product uses community trade aloe vera. It asks you to spray it on after your bath or shower. It is a light and refreshing body mist. When I had used the tester itself, I found that it smelled like actual pomegranate, complete with that slight bitter fragrance it has towards the end. It comes in a handy bottle that is great for carrying during travels. It is actually a fragrance more suited for the summers, but well, there are no rules when it comes to your mood and your body needs more hydration during the winters! So I spritz it on, soon after my bath, after applying my body lotion. You can even directly spray it on after your bath. 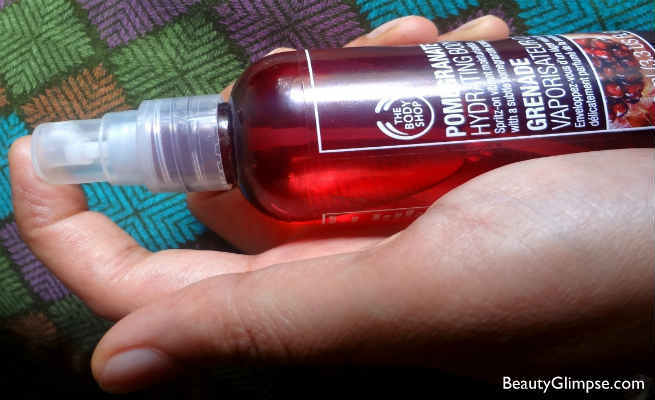 Since I also use a Pomegranate body wash, using The Body Shop Pomegranate Hydrating Body Spray soon after makes the fragrance last longer. Since it is light and not overpowering, you can be generous with it over your body, focusing on the nape of your neck, the shoulders and the wrists. The fragrance lasts a good 4-5 hours if you do not sweat too much. I have noticed that using it over the body lotion will makes it last longer. Not just after bath, but anytime you are stepping out and are feeling tired, just spray this on for an instant burst of fragrance that will uplift your mood. It is like dunking yourself in a sweet pomegranate syrup. And it is not just about the fragrance, it also hydrates your skin when you spray it on, making your skin look refreshed. Will I repurchase? Maybe not this fragrance, since by then I will perhaps be bored of it. But am certainly buying some other body mist from The Body Shop for sure!